PajDID wrote: Oh how my mouth is watering, ordered an NT Exceed Diesel yesterday to replace the current NP. BUT have to wait 4-8 weeks for delivery. The aforementioned inclusions and wish lists have given me some great ideas, thanks. The only issue is the priority order of having the extras fitted. Question for those that have them fitted or done the research- tyres? 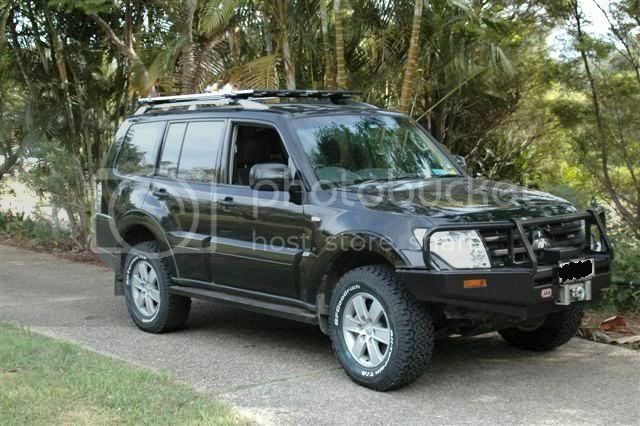 what are you using and did you have any issues fitting replacement tyres in the rear carrier, i am currently driving on Mickey Thompson Baja ATZ and would like to fit them to the new vehicle.? clocks ticking down now!! bet you're busting a seam now eh? hang in there mate. Hi guys haven't been here for a while so thought I'd check it out. Like the new thread! I've got the NT GLS with matching ARB bar like yours, only mine is in gunmetal grey. How do you like the BFG tyres? they look great on your car. I have the standard tyres as I couldnt convince the dealer i purchased from to upgrade my tyres, which is a real shame as the standard tyres are rubbish. I've only done 4,000ks so I think I'll be stuck with these until early next year, and then i'll swap them over then. I want to try and get a good 10 to 15k out of them before changing over. From my research I have done I have narrowed down my search to the BFG A/T's or the new D694's LT A/T. I can't comment on the BFGs really cos I've only done 200Ks on them! I swapped them out after my original Cooper ATRs wore very rapidly after some reasonably tough outback touring (7,000km of corrugations and rocks) - the rears were gone after 27,000km. The same outback trip I did I was with 2 cars wearing BFGs, a Pajero and a Cruiser, and both of them finished with the tyres looking as good as they did at the start, whereas mine were buggered. I was very careful with pressures and driving to conditions etc. The Pajero forum has a lot of debate over D694s vs BFGs - both have fans. Consensus seems to be that BFGs may become 'hard' after 50,000kms and not handle too well in the wet, whereas Bridgies might be better when worn, and safer on the highway in the wet. Horses for courses kind of thing really. Might be worth changing your tyres sooner rather than later - I got $500 for my old Coopers, so with only 4000km on you might get a decent price for the OEMs. Finally! FINALLY! it has arrived a shiny new Gunmetal grey NT Exceed Diesel. Picked it up yesterday and just managed to peal myself out of the drivers seat now. Stock standard so will post pics when a few changes have been made. So much quieter and smoother than the NP, but will miss the old girl. PajDID wrote: Finally! FINALLY! it has arrived a shiny new Gunmetal grey NT Exceed Diesel. Picked it up yesterday and just managed to peal myself out of the drivers seat now. Stock standard so will post pics when a few changes have been made. 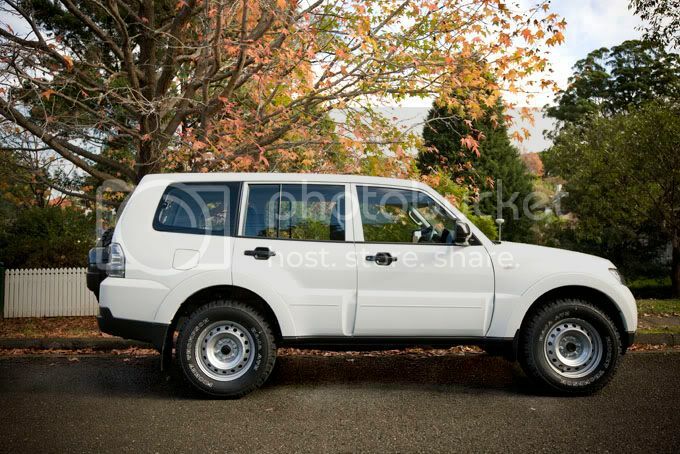 Thought I would post a couple of quick pics of my pajero. The smart bars for the Gen 4 paj have been desinged to be winch compatible. I dont think they would sell them with that claim and design, if they hadnt been tested and proved to be strong enough to handle winching. 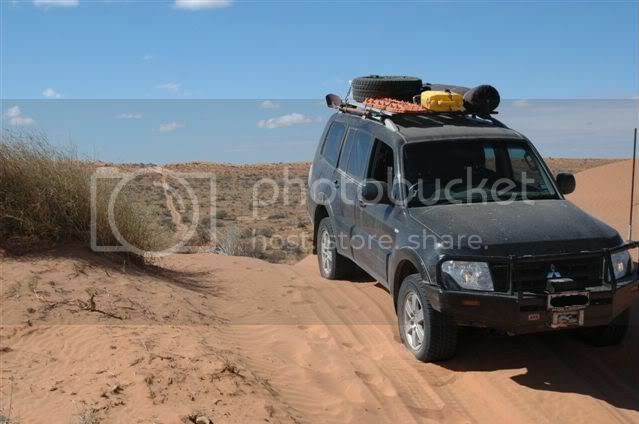 here are a couple of shots of my NS Pajero.